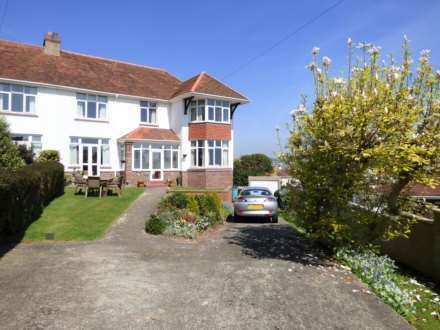 This Victorian property is within short walking distance of the harbour, town, waterside shops and restaurants in one direction, and Meadfoot Beach and the South West Coast Path in the other. Torquay is one of three beautiful towns forming the sheltered Tor Bay and is renowned for the warm climate, clear bathing waters and clean air. The town provides a wonderful quality of life for its residents with excellent shopping, waterside restaurants, a theatre and bars. Internationally renowned water sports are held in the sheltered bay, with the marina providing excellent mooring facilities for luxury yachts and motor cruisers. There are mainline railway links to London Paddington in just under three hours from Torquay railway station. The Cathedral city of Exeter is located within 40 minutes drive, as is the maritime port of Plymouth. Superbly appointed and lovingly restored late Victorian House overlooking Torwood Gardens just a short amble to the vibrant Harbour, marina, shops and restaurants. This spacious home is arranged over three floors retaining many of its original features yet providing quality modern and contemporary finishes throughout. Victorian houses are much appreciated for the features they have to offer and this one is no exception, lovely high ceilings many with decorative cornice, spacious rooms, decorative original fireplaces, original staircases and this home also has a stained window plus an internal Gothic style arched door. The ground floor provides two spacious reception rooms, modern fitted kitchen with separate utility room plus a cloakroom. Whilst the second and third floors provide 5 bedrooms plus an office and two modern fitted bathrooms. Externally you find two private courtyard areas, ideal for entertaining. The parking is on-street resident only bays immediately outside of the property. Decorative arch and ceiling cornice. Original staircase with traditional handrail and turned spindles leading to the first floor. Under stairs storage cupboard. Further cupboard housing electric fuse and meter box. radiator with decorating screening. Gothic style arched stained glass window to the side. Modern white suite with low level WC and wash hand basin. Radiator. Tiled walls and ceramic tiled floor. Deep square bay double glazed windows to the front enjoying an open aspect across Torwood Gardens. Feature cast iron fireplace with inset coal effect gas fire with a polished Ashburton marble surround. Picture rail and attractive ceiling cornice. Radiator set behind decorative screen. TV aerial point. Wall mounted cupboards. Roll edge work surface with space and plumbing beneath for washing machine and tumble dryer. Gas fired central heating boiler. Ceramic tiled floor and part tiled walls. Double glazed window plus door opening to courtyard. Radiator. Spotlight track. Original staircase with turned spindles lead from the reception hallway to the first floor. Original leaded light stained glass window with deep window sill. Dual aspect enjoying open outlook over Torwood Gardens and the surrounding area through double glazed windows. Radiator. Decorative coved ceiling. Lovely room with coved ceiling. Radiator. The double doors open onto a private decked BALCONY which is to the rear overlooking the courtyard. The balcony has wrought iron balustrade. Contemporary white suite comprising of shaped and panelled bath with rain shower and hand shower over and curved glass shower screen, Vanity unit with inset wash basin with cupboard beneath and low level WC with concealed cistern. Wall mounted ladder style towel rail. Ceramic tiled floor and tiled walls. Obscure double glazed window to the rear. Continuation of the staircase from the first to second floor. Coved ceiling. Double glazed window to the side. A particular feature is the arched Gothic style door which opens into a inner hallway with access to a bedroom and bathroom. Over stairs storage space. Double glazed window to the rear. Vanity unit with inset wash basin and cupboard beneath, with tiled splash back. Picture rail. Coved ceiling. Radiator in decorative cover. Some limited headroom. Electric and telephone points. Lovely light room with double glazed window enjoying an open aspect across Torwood gardens and the surrounding area. Walk-in eaves storage cupboard. Vanity unit with inset wash hand basin, cupboards beneath and tiled splash backs. Coved ceiling. Radiator. Contempory white suite comprising of a shaped and panelled bath with rain shower and hand showers over. Pedestal wash basin with mirror over and a close coupled WC. Wall mounted ladder style wall towel rail. Ceramic tiled floor and tiled walls. Obscure double glazed window to the front. Wrought iron gate set between two brick pillars opens to steps rising to the front door with adjacent gravelled area and wooden arch door leading to paved and walled private courtyard with outside tap, door into utility room. The pathway continues to a further courtyard bounded by high walling also can be accessed directly from the dining room. Resident permit parking is directly to the front and these permits are obtained from Torbay Council.